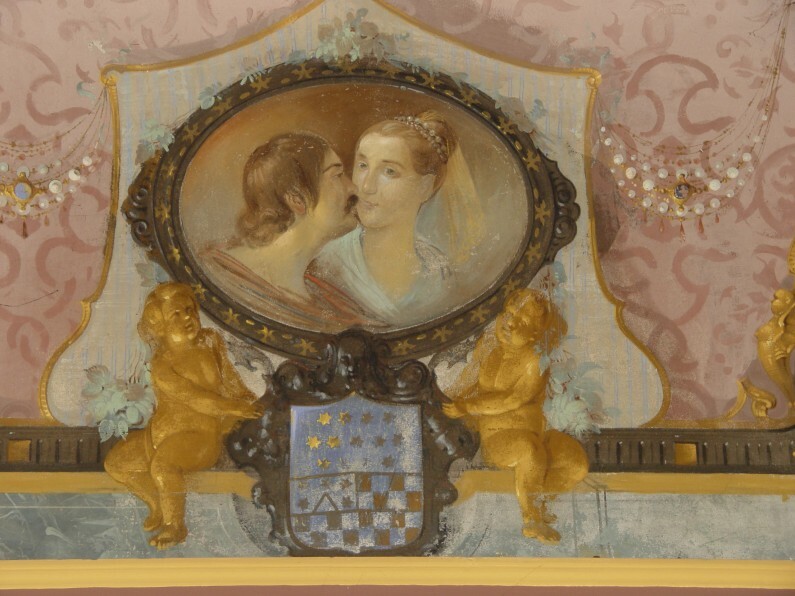 The “Hall of Kisses” owes its name to the decoration running through the vault, in which golden cupids in couples are shown at the sides of the coat of arms of Antonio Litta Visconti Arese, in turn surmounted by oval cornices containing paintings of couples in amorous effusions. The coat of arms is characterised by a now monochrome blue background, above which a golden star stands out, and a black and white square board lower down. This is enriched by a golden, typical triangular piece used in coats of arms, surmounted by five stars. The figures of the lovers are enclosed in frames created with golden profiles embellished with delicate pearls and gems that unite in the centre of the vault in correspondence with a round opening like a balustrade, from which one can glimpse the sky with a dove in the centre. The background surface imitates the effect of a false damasked, pink textile. This room was originally called the “Green Room,” referring to the colour of the tapestry on the walls, and probably the furniture it contained. In the noble homes, in fact, the colour of the fabrics used was an absolutely important feature for the owners who asked the trusted artisans or artists called to decorate their homes, to make the colour of the furniture match the wall linings, and at times this was vital to the assigning of names to the various rooms or bedrooms.